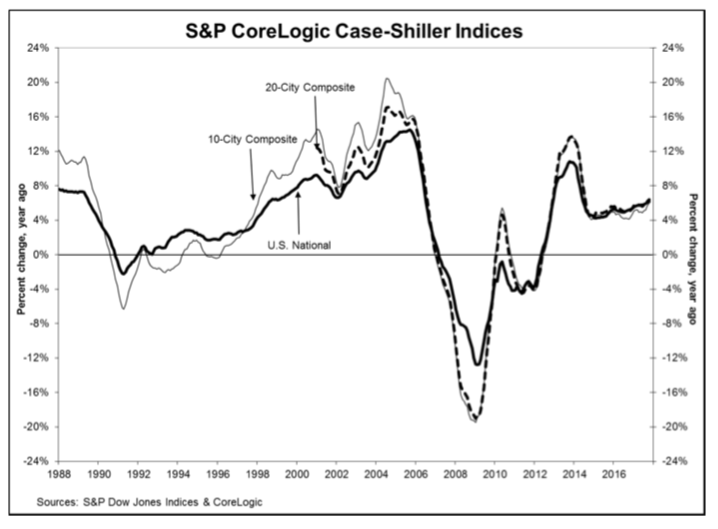 In October, home prices across the country surged 6.2 percent year-over-year, according to the latest S&P CoreLogic Case-Shiller U.S. National Home Price NSA Index, marking a slight increase from the 6.1 percent annual gain reported in September. Seattle, Las Vegas and San Diego continued to lead the pack with home price increases ranging from 8.1 to 12.7 percent. The national, 10-City and 20-City Composites all boasted 0.7 percent seasonally adjusted month-over-month gains, with all cities reporting home price growth. Managing Director and Chairman of the Index Committee at S&P Dow Jones Indices, David M. Blitzer, says home price growth continues to be fueled by low inventory, which is at a 3.4-month supply, and is currently outpacing wage growth. Blitzer also noted home price growth is reflective of positive economic factors, such as low-interest rates and low unemployment. But he expects these factors to change in the coming year, due to predictions about the Fed raising rates.